*No reasonable offer will be turned down! Support: Free to answer practice related questions. This all-in-one program is divided into six sections: comprehensive practice, vocabulary practice, reading comprenhension practice, grammar practice, English conversation, and English reading materials. There are thousands of questions for you to practice and they are carefully selected and based on many years of teaching experience. We are adding new questions all the time. Considering different levels of learners, we divide our program into three levels: elementary, intermediate, and advanced. 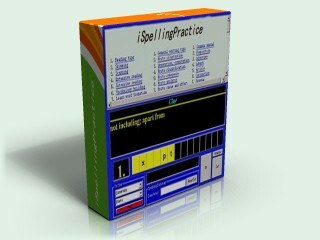 And, in addition, we also include many English learning tips in this user-friendly program. It includes grammar practice, vocabulary practice, and commonly-used verb phrases, noun phrases, and adjective phrases. All these practice questions are seen very often in tests and examinations. This practice is designed to improve students' skills to understand the overall meaning of a text, identify important details and apply what they have read. The students also learn how to get the main idea as well as the specific details and draw conclusions and make predictions. To improve your reading comprenhension, you need to have extensive reading to gain more background knowledge. Our reading materials section is especially designed for this purpose. Tense, Voice and Mood, Sentence, Verbal (Infinitive, Gerund, Participles), Preposition, Article and Conjunction, Pronoun, Adjective and Adverb, Auxiliary and Modal Verb, and Numeral and Others. Advice, election, airport, apology, arrangements, dance, bank, bus, car, chat, claims, clarifications, consolation, dislikes, doctor, eat, guest, hair, holidays, hotel, house, insurance, job, language, laundry, magazine, manners, party, phone, places, plans, police, post office, repairs, request, reservations, shopping, shows, sightseeing, sports, subway, taxi, train, visas, visit, visitors, wishes, and asking the way. AIDS, Air Bags And Collisions, Aircraft Fire Rescue, Air Pressure, Antarctica, Archery, Asthma, Aurora Borealis, Avalanche Rescue, Balloons, Bee Stings, Bicycles, Black Hole, Black Pearls, Body Fat, Bone Marrow, Bones, Broken Bones, Cancer Causes, Cancer Treatments, Car Engines, Circus High Wire, Clocks, Cockroaches, Coffee, Collecting Micrometeorites, Cratering In Your Classroom, Cryogenics, Development Of Computers, Diabetes, Diet And Nutrition, Dinosaur, DNA Finger printing, Dolphin Communication, Domed Stadium, Electric Cars, Equator, Ergonomics, Ethanol, Frisbee Physics, Galaxy Mapping, Gems, Glacier Climbing, Glass Blowing, Glass Recycling, Glaucoma, Greenhouse Effect, Hearing, High Jump, Hip Replacement, Hollywood Stunts, Household Chemistry, How TV Works, Human Eye, Human Slings hot Ride, Hypercoaster, Ice, Ice Surfing, Inca Engineering, Infrared Light, In Vitro Fertilization, Jumbo Jets, Jungle Survival, Lightning, Liquid Water, Liver, Localized Influences On Wind Patterns, Lock And Dams, Luge, Make A Comet Nucleus, Malaria Tracking, Mammoth Dig, Maya Bike Trek, Medical Quakeries, Metors, Microwave Ovens, Mineral Water, Moon Phases, Mummies, Murder Mystery, Nicotine, Novocain, OilSpills, Olympic Solar Energy, Olympic Training Center, Omnimax, Ozone, Pet Food, Phases Of The Moon, Photosynthesis, ProstheticLimbs, Protein, Rain Forest Animals, Rain Forest Plants, Reflexes, River boats, Robots, Rock Climbing, Satellite Technology, Scuba Diving, Sharks, Simulator Rides, Ski Jumping, Sky, Slinky Physics, Snow, Soccer, Solar Powered Cars, Spelunking, Steroids, Structure Of The Water Molecule, Sunken Slave Ship, Taste And Smell, Tears, elecommunications, Traffic Control, Water, Water Bug, Water Desalination, Water skiing, Wet lands, What Makes The World Turn, White Water Rafting, Wilderness Training, Wild Lion Vets, Wind Blow, Wind Direction And Velocity. 1. Memory: 500 mb up. Learning Support: Free to answer practice related questions. 1. 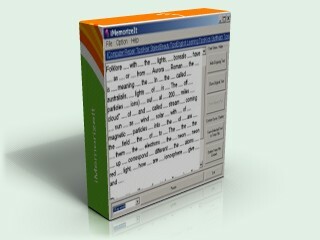 This program is based on a concise English dictionary with Over 10,000 commonly used English words. TOEFL and GRE words are included. 2. With Standard English pronunciation. 4. Read-out feature for improving your accent. Considering different levels of learners, we also design the practice into three levels: elementary, intermediate, and advanced. 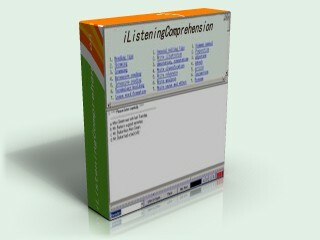 In addition, we also include many English learning tips in this user-friendly program. 1. Read out the whole text. 2. Read out a single line or a sentence. 3. Read out a single word from the line, sentence selected. 4. Read out any words typed into the text box. 5. Read out the contents of your own file. 6. Reading speed can be adjusted. 2. Repeat reading the same text. 6. View previous question with answer to know why the mistake is made. 9. Reading speed can be adjusted. 1. The speed of the eye movement practice can be adjusted. 2. Fun game with the eye span training. It comes the feature of adjustable eye span. 3. 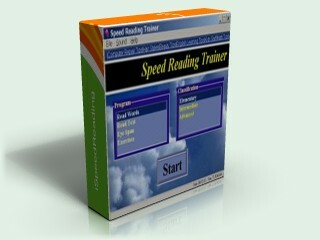 Reading comprehension test for fast reading practive. Words and lines reading can be adjusted. Considering different levels of learners, we also design the practice into three levels: elementary, intermediate, and advanced. 4. Grade report for Test practice. iMemorizeIt is designed to help you memorize the text within the shortest possible time. 1. Useful patterns: blank, repetition, and more. 2. Add and save your own text. 4. Show / Hide text. 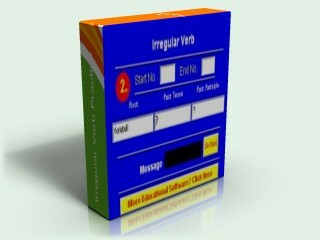 This software is designed to help people master English irregular verbs within the shortest possible time. 2. Range specify. With this feature, you can practice all the verbs one after another. And also you can practice the same verb(s) again and again until you know it/them completely. 3. Every time the verb you get is randomly selected. No need of installation! Just copy the software (a folder) given to your computer without changing anything on your computer. It's that Simple!!! 1. IBM Personal Computer or 100 % compatible with sound card, and cd-rom. 3. An Pentium II or later processor. 4. A sound card and a speaker. 5. At least 32 MB of available memory. 1. All quoted prices are in US dollars. 2. If you buy the software for your webpage, you need to tell us the URL of your webpage. 3. * - Within 60 days of the purchase of our products and other products should have the similar features and contents as ours.